The Norwegian Explorers of Minnesota, an early scion society of the Baker Street Irregulars, was founded in 1948 by five distinguished faculty members at the University of Minnesota, all of whom served as deans or department heads. Unlike some other early scions, or The Baker Street Irregulars themselves, who initially excluded females from membership, the Explorers have always been open to all. Most of the scions around the country take their name from one of the stories. Some names come directly from a story title, such as The Speckled Band of Boston or the Six Napoleons of Baltimore. Others, such as ours, are more obscure. In the story "The Adventure of the Empty House," Holmes reappears in London after having been presumed dead for the past three years. 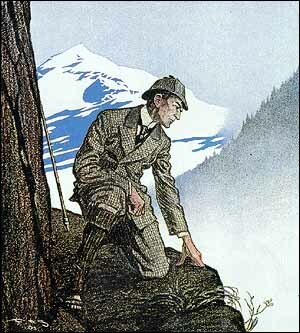 The previous published adventure, "The Final Problem," had ended with Holmes and Professor Moriarty locked in a death grip at the brink of Reichenbach Falls in Switzerland, with both presumably falling to their doom. In "The Empty House" we find that Holmes actually had survived and took the opportunity to go underground for a few years. When he explains to Watson what he had been doing all that time, he says, "You may have read of the remarkable explorations of a Norwegian named Sigerson, but I am sure that it never occurred to you that you were receiving news of your friend." One of our founders, Theodore C. Blegen (for whom Blegen Hall at the U. of M. is named) was a noted historian of Norwegian immigration to the U.S. -- thus the likely choice of the name. Another of our founders, the late E.W. (Mac) McDiarmid, led the Explorers as Sigerson from the group's founding until the early 1980s. Our last surviving founder, Dr. Bryce Crawford, Jr., passed away in September 2011, severing the last link with the group's origins. True to their academic roots, over the years the Explorers have published numerous monographs and anthologies and have sponsored several conferences.